Four of her seven perfect scores, including the first one, came on the uneven bars, which as you might imagine, was one of the three events Comaneci struck gold. It was on the balance beam that she truly showed off her skill. The beam is considered one of the most difficult Olympic events, with gymnasts performing pirouettes and backflips on a beam measuring just four inches across. Nadia was awarded three more perfect scores and her second gold medal. Comaneci actually won two more gold medals in 1980 in Moscow, but did not receive nearly as much fanfare due to the United States' boycott of the games. It was the 1976 games when she captured the hearts of the world and became the first gymnast in history to know what it's like to be perfect. 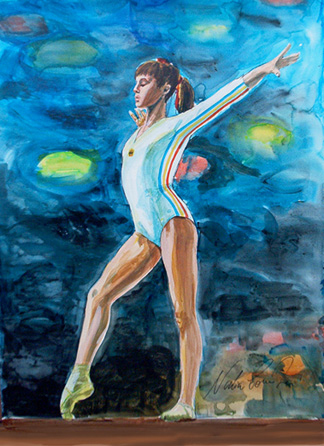 Sanford Holien's elegant portrayal of Nadia on the balance beam was done in acrylic on board. This dramatic and artistic style portrays the mystic performance that captured the attention and admiration of the world. Nadia personally signed this painting after coming to the United States.